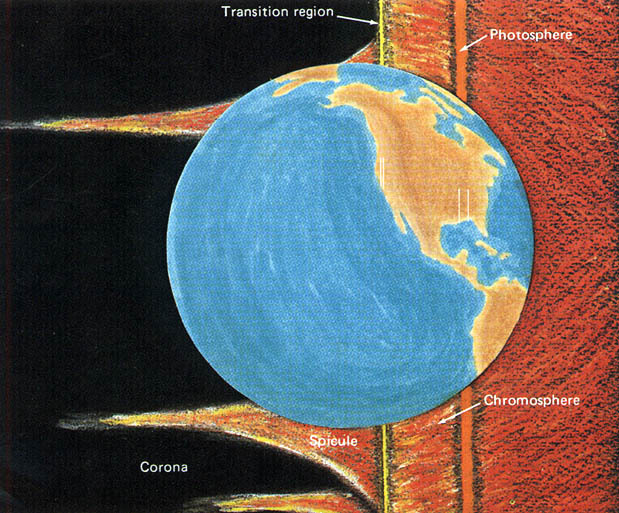 OUR TINY PLANET EARTH serves as a yardstick to scale the thickness of the layers of the solar atmosphere. The photosphere (orange layer), where sunspots are formed, is about as thick as Alabama is wide-about 400 km. The less dense and more turbulent chromosphere (red-orange) spans several thousand kilometers, stretching on our scale from Alabama to Los Angeles. The intensely active transition region (yellow), first observed in detail by Skylab, is very thin-equal in width to metropolitan Los Angeles. Spicules (red) extend the chromosphere into the corona as pointed waves whose heights are roughly equal to Earth's diameter. Prominences (not shown) and the corona (black) reach far into interplanetary space, and are much too large for our terrestrial scale.